Quote: "CHUKCHI SEA, Alaska— As Arctic sea ice this week reached its fourth-lowest level ever recorded, tens of thousands of Pacific walruses have hauled out of the sea in Alaska’s Point Lay. Such mass haul-outs have become increasingly common as the ice floes that walrus calves and their mothers rely on for feeding and resting disappear from the Chukchi Sea. Scientists fear a repeat of the stampedes that have killed hundreds of walruses at a time in recent years. Oil and gas drilling off Alaska’s coast threatens walruses through near-certain oil spills and continued melting of Arctic sea ice. After the U.S. Fish and Wildlife Service failed to give walruses the protections they need, the Center and allies sued the Service in November 2014 challenging the five-year regulations allowing Shell to harass Pacific walruses in key feeding areas as part of its drilling activities. Despite that still-pending lawsuit, the federal government issued permits to let Shell drill for oil in the Chukchi Sea this summer, touching off international protests. The National Snow and Ice Data Center reported on Tuesday that Arctic sea ice had dropped to 1.7 million square miles on Sept. 11, its fourth-lowest level from satellite records. The lowest level of Arctic sea ice was measured in 2012 (1.31 million square miles), followed by 2007 and 2011. The sea ice is expected to now begin increasing with the end of the summer season, although the ice data center cautioned that levels could continue to fall again, as happened in 2010 and 2005. Point Lay — where local villagers are helping protect an estimated 35,000 walruses and cautioning the general public against doing anything to scare or disrupt them — is located about 92 miles from the Burger Prospect site where Shell’s drilling is now underway. 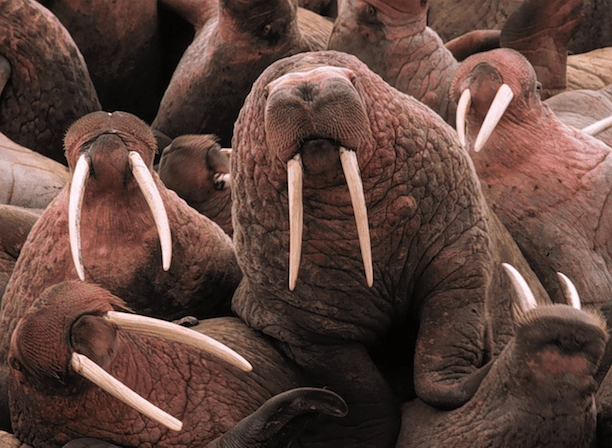 Such mass walrus haul-outs were first observed in 2007, when Arctic sea-ice extent dropped 1 million square miles below average — losing an area the size of Alaska and Texas combined.